Since 2013 – 2 years as a Consultant, 2.5 years as a Trainer and since September 2017 I dived back into the excitement of sales as a Client Services Manager. Lunch Club – Favourite Restaurant: The Woodspeen for the whole package and The Beehive for the atmosphere, and the red wine! Holiday Incentives? Every holiday incentive I’ve hit, they are too good to miss out! I even hit my first ever holiday target, a month before the end date just to make sure I was on that plane!! Barcelona has well and truly taken a place of Avanti’s heart, and possibly liver. The opportunity itself but I also loved the fact that Avanti strongly believes in internal growth. Avanti promote finding good staff, developing them into great staff and retaining them with brilliant recognition, rewards and incentives. I have been with Avanti 3 years who have developed me into the success I am now; I couldn’t be happier and I love the value I bring to the business. Overall the company’s culture is great; recruitment can be tough however the cliché of “we’re a family” GENUINELY fits with us as we are the Avanti family.. Lunch clubs are always a great reward and so much fun however our biggest lunch club at The Royal Oak, Paley Street was my favourite time at Avanti! It was in the summer of 2015 and truly was one of the funniest Lunch Clubs as well as a proud moment for Avanti due to so many of us hitting the target. Since being the CSM, I have made it one of my many missions to ensure that both our clients and Avanti have the most efficient, time managed and effective recruitment process; as a result of this I have increased our exclusive job fillability percentage by 30%. 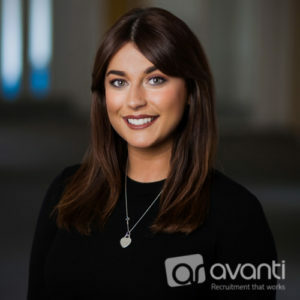 This means when you work with Avanti on an exclusive basis and have the right recruitment process in place, the job will be filled with the perfect candidate. Winning! If you want to have a genuinely successful career and have the life you have always dreamed of; you can! Avanti has the best knowledge and resource materials to get you to become a successful biller and have the career to really talk about. All Avanti need is someone to commit and dedicate themselves by putting the hard work in!